The story opens with the phrase "One imaginary day, which may or may not happen", Lois Lane and Lana Lang are visiting the Metropolis Museum. They decide to stroll down the "Hall of Heroes", a display of wax statues dedicated to legendary heroes of the past. The two stop and comment on the statues of Hercules and Samson, which are side by side. They discuss the fact that they would both very much like to be married, and they agreed with each other that if these two heroes of the past were around now, neither Lois nor Lana would wait around for Superman to make up his mind about matrimony. Outside the museum, Superman overheard those comments and decided not to let time stand in the way of testing that. He flew into the past to get Hercules, who at that moment was winning a tug-of-war with about twenty or twenty-five guys on the other end of the rope. With Herc on his back, he then flies off to ancient Israel to get Samson, who was on his own, battling a horde of Philistines. With the two in tow, he flies back to 1961 Metropolis. Arriving back, Superman gave each of the two historical heroes a Kryptonian apparatus that they placed on their heads that would automatically help them to understand and speak modern English. He then explains to them that there are two girls in this time that want to meet them with marriage as a possible outcome. The understanding is that if they fall in love with Lois and Lana, they can stay in this time and be married, if not, Superman agrees to return them to their homes in the past. Hercules and Samson both agreed to the terms and were both excited to meet their prospective brides. As soon as the girls and guys meet, Hercules and Lois pair off, with Samson and Lana also taking a liking to each other automatically. The guys decide to impress their new girlfriends, with Hercules uprooting a tree and re-planting it in a spot where it will give Lois more shade from the sun's heat. Not to be outdone, Samson puts his fist through a section of rock that causes a stream of cool water to flow out, because Lana had mentioned she was thirsty and could use a cool drink. It is at that point, that Samson and Herc both get down on one knee and propose to Lois and Lana, both promising that they will do anything to make the girls happy. The girls are both in agreement that they would be crazy to pass up a chance like this at marriage, so they both take about one second to decide, then they accept their respective proposals, and the four set off for the Metropolis Marriage License office. At the License Bureau, the lady clerk informs them that marriage licenses are not granted immediately, they will have to wait for one week. Lana and Lois decided it would be a good use of that time to try and find jobs for the boys, so they will be provided for once they are married. 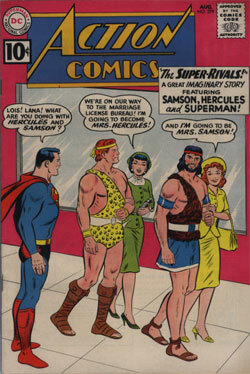 Lana goes to a television ad agency to get the guys jobs in television commercials, while Lois talks to a movie producer who seems intrigued with the idea of doing a "Hercules meets Samson" movie, and thinks it would be great publicity if they continued to wear their clothing from the past. He gives the two an advance salary on the movie deal, and they in turn decide to use the money to buy houses for their brides-to-be. Hercules buys a house in the suburbs for Lois, but she decided she didn't like the spot on the property where the house sat, so she gets Hercules to pick up the house and carry it on his back, trying out different locations on the property. By nightfall, Lois still had not decided on the right spot, with a tired Hercules wondering how much longer it will take before Lois makes up her mind. In the meantime, Lana asked Samson to put up a privacy fence around their property and he agreed to do so. A helicopter flew overhead, so Lana complained that it still was not sufficiently private. Samson then moved a hill alongside their home so that low flying aircraft would have to fly higher to avoid hitting the hill, thus keeping the couple free from prying eyes. As soon as Samson finished the project, Lana decided that she didn't like not having the view that the house previously had, so she asks him to move everything back, just as it originally was. A tired Samson complied. Lana decided she wanted a pet, but an unusual pet, recalling stories of ancient queens who kept leopards as pets. Samson went into the mountains outside Metropolis and found a mountain lion that he would take back to Lana, reasoning that with him around, Lana was in no danger from the big cat. In celebration, Lana prepared a barbecue, but as the cooking was completed, the lion got loose and pounced on the food. By the time Samson took care of him, the meat was gone and Lana told Samson, "All I can give you now are lettuce sandwiches" which wasn't what a hungry Samson wanted to hear. Over at the Hercules house, Lois saw how Lana got an exotic pet, so she decided that she wanted one. Lois told him she likes birds, so Hercules proceeded to go to the Metropolis Zoo and grabbed an ostrich. So that no one would consider it stealing, he left behind a priceless ruby by which the zoo could purchase another ostrich. Later, the zoo put out a public service announcement intended for the bird's new owners that this species of ostrich is easily susceptible to colds if he's kept outdoors, so he needs to be kept warm if he stays outside. The end result is that the ostrich gets to sleep in Herc's nice warm hammock, while he sleeps out huddled in a tree, shivering in the cold of the night and listening to the ostrich snore. The next day, the two couples went shopping. Lois and Hercules went clothes shopping for Lois at a local department store, while Samson and Lana visited a new car dealership. Lois and Hercules came out of the store with Herc carrying a huge armload of packages, believing that Lois literally had bought out the store. Meanwhile, Samson bought Lana a new convertible, which she proceeded to drive out of the showroom and directly into the nearest street light, totaling the front end of the car. As Samson carried the car on his back, Lana mentioned that she regretted not purchasing car insurance before they bought the car. Later, the four get together for a meeting at which Samson tells Lois and Lana that after they purchased the houses, clothes, and car, he and Hercules have spent the last of the money they received for the movie deal. The girls were totally unphased by the announcement, stating they could go out and earn more money with new jobs that the girls could find for them. Lana got Samson a job with a wrecking company, while Lois secured a position for Hercules as an athletic trainer for the Metropolis Giants, a professional football team. Samson reports for work at the wrecking company and the results were nearly a disaster. He was instructed to demolish an old courthouse to make room for a new skyscraper the city was planning. He tied chains around the front columns to pull them out, intending that the lack of support would collapse the structure. He yanked so hard on the pillars that they went flying in all directions like missiles, requiring Superman to stop the flying pillars from causing destruction all over the city. Samson was then fired by his foreman. Hercules did not fare any better in his new job. The excitement of the head coach over having him with the team soon changed to fear for his players after Hercules put several of them in the hospital when they tried to tackle him in practice. Finally, on the outskirts of Metropolis, Hercules and Samson begged Superman to take them back to the past, with both stating that the girls were driving them crazy. Superman did so, and the very next day, both Lois and Lana had "For Sale" signs in the front yards of their houses and they immediately returned to arguing with each other over which of them Superman preferred. Story - 5: The 5 rating is given because this story is without a doubt, clearly one of the funniest Superman stories I have ever read. In terms of characterizations and settings, it's not much different from most other Superman stories of the late 50s/early 60s. But the humor in this story is just delightful in the way that it takes a totally implausible situation (two characters pulled out of the past) and puts them in modern situations with such business-as-usual reactions by Lois, Lana, and some other characters in the story. Here are a few examples: I about cracked up when I read this. After wearing the learning machine on his head, Hercules says, "Thou hast made me speak English fluently. Listen to the strange words I now know - 'Golly' - 'Hot Dog' - 'Rock and Roll' - 'Space Satellite'." When the four go to the license bureau, the clerk matter-of-factly says "I just heard about your appearance from the past", as if this is a nearly every day occurrence in that office. It's like her next sentence might have been, "Hey, we didn't make any special allowance for Atlas, Robin Hood, or Johnny Appleseed when they applied, why should we do it for you?" Lana decides she wants an unusual pet, something no one else has, so Samson, logically, tracks down a mountain lion (so common after all in the suburbs of major cities like Metropolis) and subdues it with a punch in the face. Dragging the big cat home by the tail, Samson finds Lana appreciative. "Chain it up," she says, "and I'll make you dinner." Samson also shows a bit of sarcastic wit. While carrying the totaled car on his back, Lana, who is sitting in the car, says "We'll buy another car tomorrow", Samson replies "Of course dear! What's money for, except for my precious Lana to spend?" while he's thinking "and spend, and spend, and spend!" It even had Lana cutting Samson's hair, the reason being he got bubblegum in it, and of course, he lost his strength. I just thought this was, as humorous Superman stories goes, one of the best I've read. It is unfortunate that the identity of the author of this story is not known. I was never able to track down any source that could supply a name to the writing of this tale. In my opinion he (or she) deserves kudos for such a cleverly written humorous story. Art - 5: This story was both pencilled and inked by artist John Forte, who according to my research was more often the artist for the Legion of Super-Heroes in Adventure Comics. He was certainly familiar with how to draw the Superman family of characters because much of his work could also be seen in issues of Jimmy Olsen and Lois Lane from 1958 into the 60s. He had on some occasions inked for Curt Swan, but he wasn't as a rule the artist for Superman or Action Comics. His familiarity with the characters and his particular style and eye for certain details worked very well for me in this story. The comical writing of this story was well highlighted by some of the character's reactions and facial expressions as drawn by Forte. It was a great effort on his part. Cover Art - 4: Another very good cover job by the team of Swan & Kaye. Probably the only reason it rates a 4 rather than 5 with me is that as good as the Swan/Kaye covers were, the Swan/Klein covers of a few years later were, in my opinion, a little better in style and detail, with Swan's style having progressed, and Klein's inking a little more to my liking.